When we completed this Casino Midas review, we were feeling terribly pleased with ourselves. We had eagerly anticipated the arrival of this online casino. 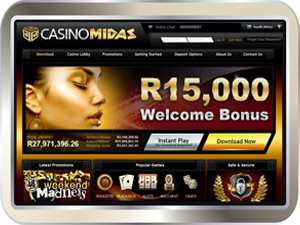 Casino Midas is a relatively new online casino offering play in South African Rands as well as a number of other currencies. That might be normal for some of the other casinos where the facilities are already in place with the software provider but Casino Midas was not that fortunate. They are trend setters, breaking new ground. This effort intrigued us but we did follow through and find that the effort was mirrored in all aspects of casino management. They have blazed a trail of honesty and generosity so far and we have to admit that we are expecting great things here. Their online casino games are driven by RealTime Gaming software and features some of the most funfilled video slots available. The Real Series video slots are amongst the most popular and feature not only great payouts but eye candy in the graphics as well. You will also find that they presently have one of the biggest video poker libraries where players have the choice between single handed and multi hand versions of video poker (up to 100 hand versions to be precise). The customer service here is efficient and friendly, and are available in Live Chat, via e-mail and Telephone.